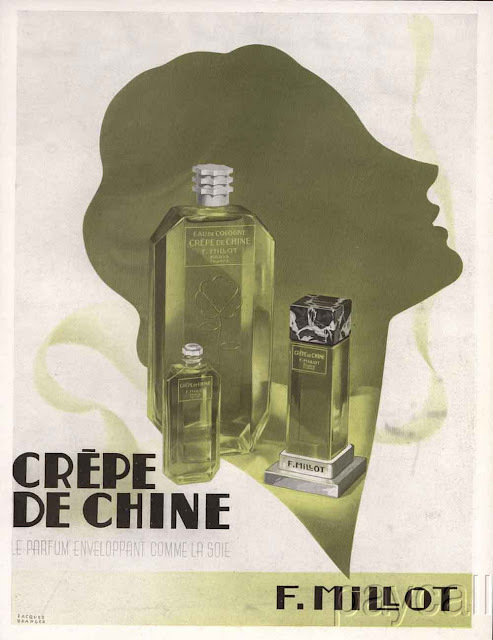 How beautiful are these vintage ads (1937-1963) of Millot Crêpe de Chine? And the bottles! They tell the story of Crêpe de Chine well enough one could almost guess what it smelled like. This 1925 perfume was a floral chypre, out of this time and out of this world. I recently opened a tightly sealed bottle of Crepe de Chine parfum that I happened upon in an antique mall. I had no idea if the juice was alive or if there will be any decent top notes left. After all, bergamot and aldehydes tend to go stale eventually, and if you want to enjoy many vintage perfumes you need to first sit through about 15 minutes of Miss Havisham's drawing room. I was luckier than I deserve. My Crepe de Chine smells perfect. I won't call it fresh, because it was never meant to be that. This fragrance from Felix Millot's perfumery is incredibly full-bodied and lush. The jasmine is dirty and huge, wonderfully blended with carnation and rose into a very feminine perfumy heart. I doubt that my bottle hales from the 1920s (Crêpe de Chine was discontinued in the late 1960s, after the house of Millot was sold), but it definitely smells like a product of that time, an era that gave us the classic Chanel, Guerlain and Coty perfumes as well as antique cars, flapper dresses and jewelry, red lipstick, and women eager to break and defy confining traditions. Part of the magic of true chypre perfumes is how well they evoke a certain kind of glamour. The other part is that they smell incredible. To the modern nose, big bold chypres that are so laden with oakmoss may smell masculine. I do believe that they can be just as easily worn by a man who appreciates their thick oily darkness. Millot's Crêpe de Chine has plenty of that. It's kind of what I imagine the original 1920s Chypre de Coty smelled like, something fit for the Algonquin's Rose Room. bergamot, lemon, neroli, orange, jasmine, rose, lilac, ylang ylang, carnation, oak moss, vetiver, benzoin, labdanum, patchouli, musk, and leather. You can read more about Crepe de Chine on Yesterday's Perfume and in Angela's review for Now Smell This. All images of vintage Crêpe de Chine ads from various online auctions. Do we have antique shop synchronicity or what? I also recently scored some vintage CdC parfum while making the secondhand shop rounds. At first I thought it was spoiled because what emerged from the bottle (after being stuck shut for decades) smelled so rancid, like something from a tomb. But this dissipated, and now I am bowled over by this profound and lush chypre. Enjoy it to the fullest! I remember seeing mag ads for Crepe de Chine in the seventies. The fragrance was available in drugstores, alongside Charlie! This I remember because when I was buying candy I would sneak a look at those perfume testers. All I can say is that it smelled...not like Love's Fresh Lemon. I asked my brother for this perfume one year for Christmas. This must have been in the early 1970's. He bought it at a perfume store in the Watergate complex in D.C. The SA said "What does she want THIS old stuff for?". I wanted it because of all the beautiful ads. Well, I can't say I really liked it, but I loved owning it. Recently I bought a perfume oil "in the style of" Crepe de Chine. I don't know if it's anything like the original - I just can't remember. I'm glad I have it though, because now I can appreciate it better. It's definitely some CdC synchronicity! I discovered it by chance on Thursday and absolutely enjoyed it! My boss used to bring me back CrepedeChine from Bermuda in the early and mid-1960's. It was in a tall bottle with slanted sides. Oh, the fragrance! I have never found any perfume to compare. I wish I could find it again-it would bring back so many memories of my youth-I'm now almost 65, but in my 20's in my mind. Please let me know if there is anywhere CdC can be found. I would be so happy. Thank you!